Snow closes Arches, Canyonlands. Shutdown leaves no money to plow roads. Nonprofits pitch in at Zion, Bryce. 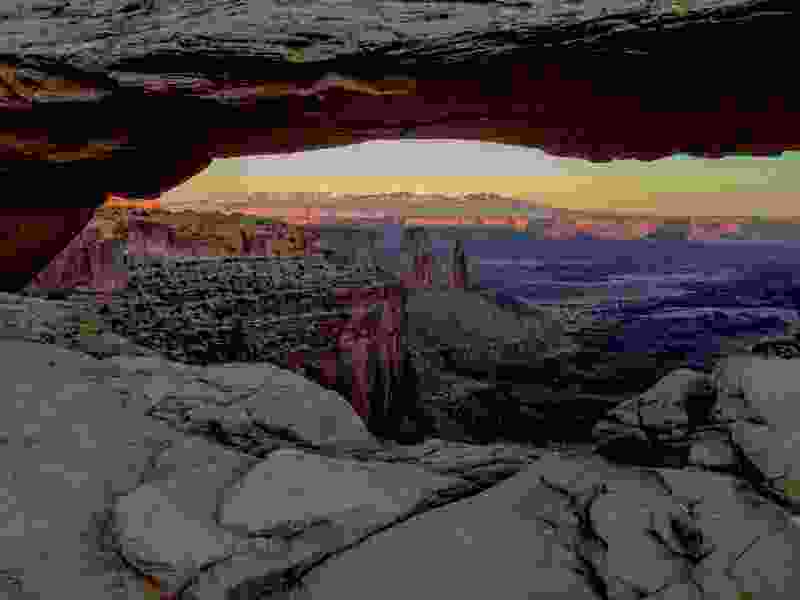 Erin Alberty | The Salt Lake Tribune The low, winter sun picks up blues and purples under Mesa Arch on Dec. 1, 2015, in Canyonlands National Park. With fresh snow covering the roads and no personnel available to plow them, Arches and Canyonlands national parks shut their gates Monday as the federal government’s partial shutdown ground through its second week. Utah has been funding some personnel costs at Arches and two other busy national parks since the shutdown started Dec. 22, but that money was being used to staff visitor centers and clean toilets, not clear roads. 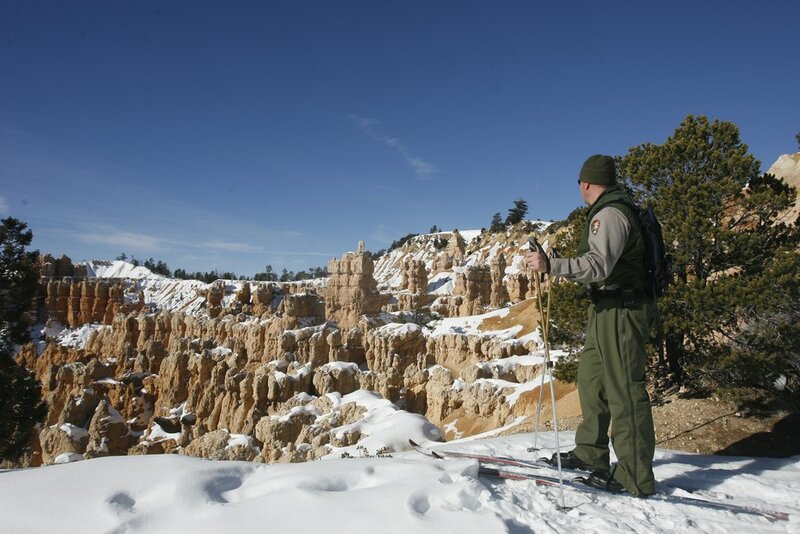 The state funding was to run out Monday for Bryce Canyon, Arches and Zion, but these parks will remain accessible during the remainder of the shutdown, weather permitting, as are all other park units in Utah. Private money will keep visitor centers open at Bryce Canyon and Zion beyond Monday. While snow was forecast for Tuesday morning, the weather is expected to be clear through the end of the week at Arches and Bryce. Garfield County has agreed to help keep Bryce Canyon’s road open should the need arise. The park’s Sunrise and Sunset points will remain accessible by vehicle, although attractions south of Inspiration Point will not be accessible. “The roads are still icy so visitors better know the conditions and be careful,” Bryce Canyon Superintendent Linda Mazzu said Monday. While private groups are rallying funds to maintain visitor services at Bryce and Zions, the Friends of Arches and Canyonlands Parks has not been asked to help fund services at parks the Moab-based nonprofit serves, according to Executive Director Joette Langianese. “Our donors are here to support the parks, not something the government should be paying for," she said. Langianese believes the park service made the right call closing Arches and Canyonlands, both accessed by long, switchbacked approach roads. The ever-popular Delicate Arch, for example, is reached by a trail across sandstone that is very slippery when icy. A slip can send a visitor sliding over a precipice. In the wake of Monday’s storm, the park service has posted nothing about the status of roads at Zion and Capitol Reef national parks and Natural Bridges and Dinosaur national monuments. The Zion Forever Project is putting up about $2,000 a day needed to partially staff Zion through Saturday, while the Bryce Canyon Natural History Association is funding basic visitor services at Bryce through at least Jan. 10. The visitor center is open 8 a.m. to 4:30 p.m.
On Tuesday, some of Bryce Canyon’s concessions, such as the General Store and Bryce Canyon Lodge, were to close for the season. Meanwhile, parking at nearby Sunrise and Sunset points fills up quickly, even though winter is Bryce Canyon’s “slow” season. He fears the negative publicity surrounding the government shutdown, if it drags on, could discourage people from visiting Bryce this winter. As part of the Department of Interior shutdown contingency plans, all national parks and monuments would remain open to visitors, but it wouldn’t provide visitor services, like restrooms, trash collection, and road and facility maintenance. The park service’s social media accounts and websites are not monitored or regularly updated and may not reflect current conditions at any of the 400 national parks, monuments and other sites. However, the usual entrance fees will not be charged. At Utah parks, new permits for backcountry destinations are not being issued, but commercial guides and outfitters might be able to conduct trips as usual. All park programs have been canceled, including scheduled ranger talks and evening programs.